To keep up with the growing population, in 2015 a $173 million bond passed for New Caney Independent School District to construct a district natatorium, new campuses, more classrooms for current campuses, renovate existing buildings and infrastructure, and purchase land for future growth and expansion. In support of Stantec, Counsilman-Hunsaker provided aquatic design and engineering services for the 33,000 sq. ft. aquatic center, which includes an 8,600 sq. ft., eight lane, stretch 25-yard competition pool with movable bulkhead, 1M & 3M diving, spectator seating for 400 people, locker rooms, a hospitality area, concession stands, and athletic administrative offices. 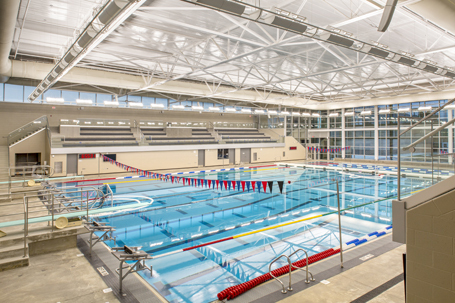 The aquatic center provides space for multiple high school teams for training and competition, and will help the district host regional University Interscholastic League (UIL) meets. The addition of the aquatic center addresses several issues including the district’s commitment to continue providing students with an opportunity to participate in competitive UIL swimming and diving. A neutral site aquatic center will serve growing swim programs at both current high schools as well as a potential future high school. The center will provide students with a facility that meets UIL standards for swimming and diving and will allow NCISD to grow its programs and select competitions.